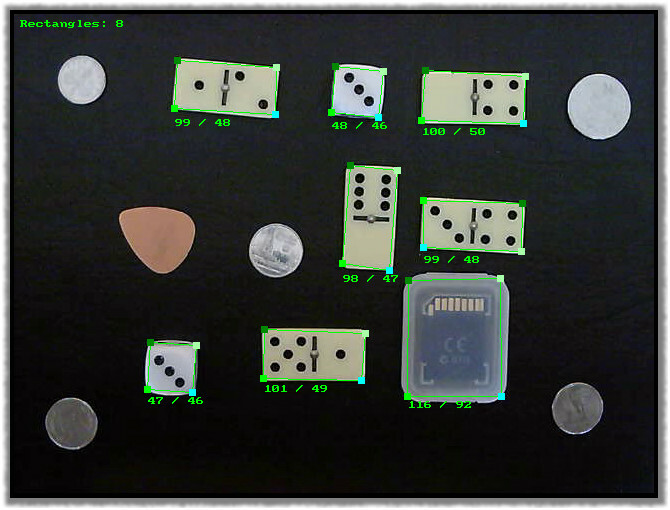 The 1.2.7 version of Computer Vision Sandbox comes with an updated blobs processing module and provides couple of new interesting plug-ins. Those can be used for detection/filtering of some simple shapes like circles, rectangles and squares. Let's have a look at how that can be done. Being from blobs processing family, both Filter Circle Blobs and Filter Quadrilateral Blobs plug-ins require a pre-processed image as input. It must be a grayscale image, with black representing background and white (or shades of gray) representing objects. This type of segmentation can be achieved using different image processing filters depending on the source images coming from video source/camera. In the set-up for this tutorial we used a dark background - darker than any of the objects to detect. And so simple thresholding worked well as the initial segmentation step. We'll start with circles filtering first. Creating a simple video processing graph with the Filter Circle Blobs plug-in like shown above, should produce an image, which contains objects with circle shape only. Everything else is removed. Using the Filter Circle Blobs plug-in with default settings should work for most of the cases. However, few settings may require tuning to achieve the desired result. The first thing to do is configuring minimum and maximum circles' radius to keep. Circles with radius values outside of the specified range are removed as well. Then using relative distortion and minimum distortion properties it is possible to control how perfect should objects fit a circle shape. Increasing these values will result in accepting objects with a not so circular shape. While keeping them small will accept only nice shaped circles. Replacing the Filter Circle Blobs plug-in with Filter Quadrilateral Blobs in the above video processing graph will result in keeping quadrilateral shapes only (shapes with 4 corners) and removing everything else. To narrow down the variety of allowed shapes, the plug-in allows choosing from few common quadrilateral shapes like rectangles and squares. In addition it provides properties to filter shapes by size and control acceptable deviation from the ideal shape. Of course filtering an image by removing unwanted objects is useful in many applications. However, very often it is required to get information about the required objects, like radius and center of circles, or coordinates of rectangles' corners, etc. Both Filter Circle Blobs plug-in with Filter Quadrilateral Blobs plug-ins can provide this information. 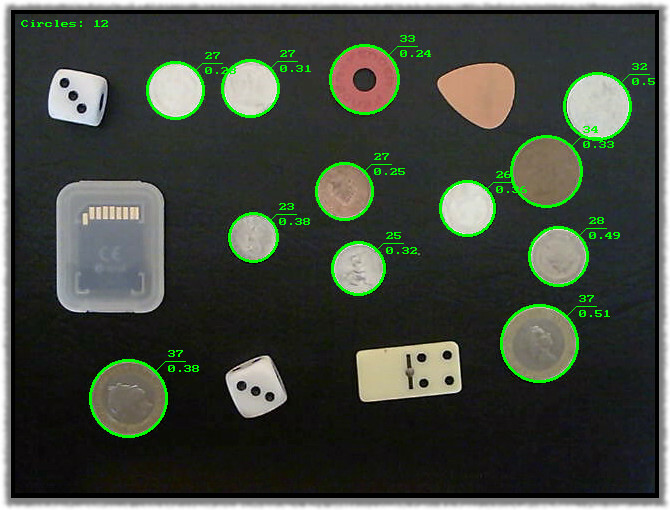 All is needed is to process an image first and then inspect some of the plug-in's read only properties, which provide information about what was found in the image. This can be done from scripting though. Let's start with circles first. local math   = require "math"
The above script does the first step - it does pre-processing of an image to separate objects from background and then applies circles filtering plug-in. The source image coming from camera is then updated to tell how many circles are detected. Now, let’s add some more code and highlight each detected circle using the information provided by the plug-in (replacing the 'TODO' comment). The above code completes the circles' detection script - each detected circle is highlighted, its radius is displayed, as well as mean deviation from the ideal shape (smaller value means the shape looks closer to circle). The end result should look something like the image below. Using Filter Quadrilateral Blobs plug-in similar result can be achieved for rectangles detection. The script below highlights all detected rectangles, and reports length of their two sides (longer one goes first). local math  = require "math"
And here is the result of its work. All of the rectangular objects seem to be highlighted as needed. Both Filter Circle Blobs and Filter Quadrilateral Blobs plug-ins can be very useful in many different applications. Each of them become a very good extension of the already existing blob processing capabilities provided with the Computer Vision Sandbox application. And there is more to be developed. Note: here are complete scripts for detection of circles and detection of rectangles.